The Tall Stories team opened The Snail and the Whale at Arts Centre Melbourne yesterday; I took my two sons along to see it. Having seen the same production team's brilliant stage adaptation of The Gruffalo few years back, I had high expectations for The Snail and the Whale, and was not disappointed. The delightful tale, based on the book written by children's author Julia Donaldson and illustrated by Axel Scheffler published in 2003, follows a little snail who wishes to see the world, and does so on the tale of a whale. Right from the onset, children are taken on a nautical journey, with sea themed decor to enjoy in the foyer, which matches that of the stage set; simple but surprisingly adaptable throughout the show. Much like Tall Stories' adaptation of The Gruffalo, there are only three actors in The Snail and the Whale. I have so much respect for a children's theatre performance, which engages the audience with a limited stage set and only three actors, one of which plays the music for the entire show on her electric viola. This stage adaptation is a story that infuses a sweet tale of young girl and her father; a seaman who is gone for lengthy times out on the high seas. What brings the father and daughter together, is the bedtime book; The Snail and the Whale. 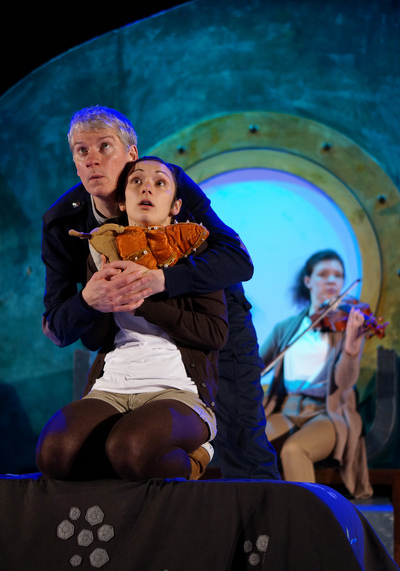 On stage, the young girl becomes the little snail, and the father, the whale. It's a touching play, which not only addresses the bond between father and daughter but also shares the beloved story of The Snail and the Whale in a delightful way. Both my 7yo and (to my surprise) 2yo sat engrossed throughout the 55 minute performance. Expect plenty of laughs when the actors mix with the audience! The Snail and the Whale at Arts Centre Melbourne is a beautiful, fun and creative little show that appeals to all ages. A must-see during the winter school holiday break. On till 10 July, 2016. When: Wednesday 29 June – Sunday 10 July, 2016. Various show times. Book: visit artscentremelbourne.com.au or phone 1300 182 183.